Forest transitions (FT) occur when socioeconomic development leads to a shift from net deforestation to reforestation; these dynamics have been observed in multiple countries across the globe, including the island of Puerto Rico in the Caribbean. Starting in the 1950s, Puerto Rico transitioned from an agrarian to a manufacturing and service economy reliant on food imports, leading to extensive reforestation. In recent years, however, net reforestation has leveled off. 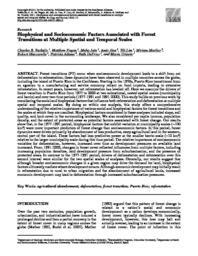 Here we examine the drivers of forest transition in Puerto Rico from 1977 to 2000 at two subnational, nested spatial scales (municipality and barrio) and over two time periods (1977-1991 and 1991-2000). This study builds on previous work by considering the social and biophysical factors that influence both reforestation and deforestation at multiple spatial and temporal scales. By doing so within one analysis, this study offers a comprehensive understanding of the relative importance of various social and biophysical factors for forest transitions and the scales at which they are manifest. Biophysical factors considered in these analyses included slope, soil quality, and land-cover in the surrounding landscape. We also considered per capita income, population density, and the extent of protected areas as potential factors associated with forest change. Our results show that, in the 1977-1991 period, biophysical factors that exhibit variation at municipality scales (~100 km²) were more important predictors of forest change than socioeconomic factors. In this period, forest dynamics were driven primarily by abandonment of less productive, steep agricultural land in the western, central part of the island. These factors had less predictive power at the smaller barrio scale (~10 km²) relative to the larger municipality scale during this time period. The relative importance of socioeconomic variables for deforestation, however, increased over time as development pressures on available land increased. From 1991-2000, changes in forest cover reflected influences from multiple factors, including increasing population densities, land development pressure from suburbanization, and the presence of protected areas. In contrast to the 1977-1991 period, drivers of deforestation and reforestation over this second interval were similar for the two spatial scales of analyses. Generally, our results suggest that although broader socioeconomic changes in a given region may drive the demand for land, biophysical factors ultimately mediate where development occurs. Although economic development may initially result in reforestation due to rural to urban migration and the abandonment of agricultural lands, increased economic development may lead to deforestation through increased suburbanization pressures.